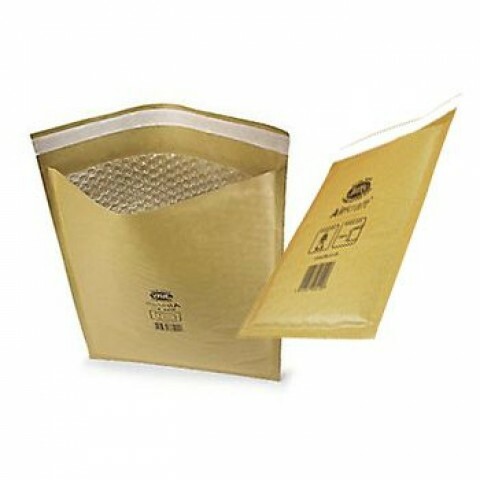 Buy Quality Jiffy Envelopes Airkraft Bubble Padded Envelopes Mailing Bags, Available in All Sizes, Small / Medium / Large (A3 / A4 / A5). Sealedair & Jiffy Padded Envelopes Postal Shipping Parcel Mailing Bags Comes in various Different Sizes however they serve for the same size range for example, A / JL000, B / JL00, C / JL0, D / JL1, E / JL2, F / JL3, G / JL4, H / JL5, J / JL6, K / JL7. The Jiffy Bags Size Guide is available in our Product Image so you can decide what size would fit best for your product / item. The 90gsm outer paper is polyethylene coated (12micron) making them resistant to tearing and puncturing, helping protect your products in transit. Our Jiffy bubble lined bags are manufactured with a peel and seal strip, to help with speed of packing and to ensure a fully secure closure. They are gold in colour. The name synonymous with bubble lined bags is Jiffy. One of the main advantages Jiffy bags have over macerated paper or card is that they are light and don’t burst if split.